CONDITION REPORT: Stunning and mint condition, the dial and hands are perfect and have a nice cream patina. The case is as sharp as can be with only a few minor wear marks. The caseback retains its red seal attesting to the originality and well preserved state of this example. NOTES: According to the Omega Museum, the present watch was manufactured on July 18, 1988 and delivered to Germany. This matches the German language day indication. 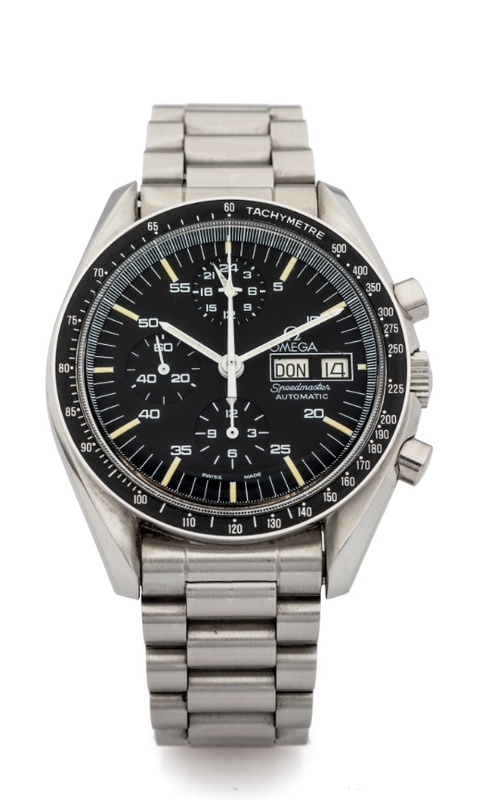 This Omega Speedmaster, Ref. 376.0822, is the only full size moonwatch case Speedmaster with an automatic movement. The automatic chronograph movement is an Omega calibre 1045 based off the Lemania 5100 with a day/date indication as well as 24h indicator (useful when setting the date) and a central chronograph minutes ‘airplane’ hand. This model was launched in 1987 and saw a very short production run of only two years, which makes it even more sought after by collectors. It is commonly called the Omega ‘Holy Grail’, a term that comes from Chuck Maddox, a famous author who contributed greatly to cataloging Omega chronographs and their history. Chuck Maddox spent so long tracking down this model for himself that he began calling it the Holy Grail.